The DX8 is the most advanced 8-channel system you will find anywhere. Its next-generation Spektrum™ AirWare™ software, built-in telemetry, Spektrum Data Interface and superior ergonomics will completely revolutionize how you fly. 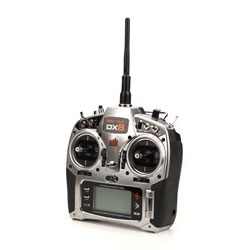 And it’s the only 8-channel that gives you these advanced capabilities, plus the proven speed and precision of Spektrum 2.4GHz DSMX® control. The DX8 features ModelMatch™ technology that prevents operating a model using the wrong model memory. This feature can prevent stripped servo gears, broken linkages and even a crash due to attempting to operate a model using the wrong memory.